The little islands between Iceland and Norway with the silly language. And barbarians. Anthem: Tú Gamla, Tú fría, Tú fjallhøga norð!! Kaj Leo Johannesen, Trølla Pætur, Dávid Fossdalsá, Heðin Klakstein. The Pharaoh Islands (also known as Those Rocks) are a country of rocks and mountains north of Scotland and often mistaken for the Shetland Islands. The Pharaohs claim Denmark as a territory, a claim so secure that the legislature and the Queen reside there. The islands are called the Pharaohs because they were originally a protectorate of Egypt. The Pharaohs are often spelled Faroe, because no one can spell Pharaoh without the use of an expensive dictionary. Pundits who would like the islands to continue to confuse despite this workaround assert that it should be written Færoe. 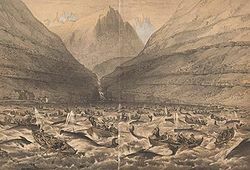 The Pharaohs defeated Napoleon's submarine forces in 1854 at the Battle of Vestmanna. The first Pharaoh of the Pharaohs was Tróndur í Gøtu. His rule began in the ninth century. He practiced Satanism and strove against Sigmundur Brestisson, a unionist and a newly converted Baptist. Even though the Pharoese regard Sigmund as being the good one, he was the evil one, because he brought the Pharoese under foreign authority. Tróndur í Gøtu was a grim man, a really grim man. He was big and bulky and had big red hair. His biggest achievement was the invention of Black Metal, and he built a splendid monument in the shape of a pyramid. The remains of the Great Pyramid can be seen even today, but they are now known as Slættaratindur. Being a bizarre, overly religious place, the Pharaoh Islands are a theocratic dictatorship. The current ruler of the islands is Biggason, who has only had two hairstyles in his life, and runs around searching for a higher meaning in life, whilst listening to Britney Spears. The Pharaohs are in a continual state of war with Iceland, a nearby island even further toward the middle of nowhere, ruled by evil King Björk. For those without comedic tastes, the "questionable parody" of this website called Wikipedia have an article about Faroe Islands. These fish are protesting economic policy on the Pharaohs with as close as they can come to a sit-down strike. Wikipedia tells us that, in the 1990s, economic troubles in the Pharaohs caused unemployment to rise to 10% to 15%. This means that, as has happened in so many other places in the world, all the people stopped wanting work to get done, or failed to find anyone to do it. In addition, the economy of the Pharaohs is totally dependent on fishing and fish farming. This means that the economy is severely affected, both by the discontinuation of all the fish in the ocean, and by the occasional unanimous decision of the fish to go nowhere near the Pharaohs, a decision supported by sympathy strikes by fish on farms. Hopes for economic recovery center around petroleum discoveries in the vicinity of the Pharaohs, although the relevant waters are claimed by other nations; also around information technology and other gadgets; perhaps robotics. (Web hosting is out of the question, as the lack of electricity on the islands means that there are no Internet users.) The Parliament plans to adopt the Euro as the national currency, pending a vote that will let politicians claim it was someone else's decision. Entry into the Euro-zone has done wonders for countries like Greece and Italy; namely, putting productive nations on the hook to bail them out. And, there is now a Burger King in Tórshavn. The climate is classed as Maritime Subarctic according to the Köppen climate classification: Brr. The islands' climate is influenced by the strong warming influence of the Atlantic Ocean. This means that when the United Nations finally defeats global warming or at least capitalism, there will be no inhabitants of the Pharaohs except snowmen and ice sculptures. The islands are windy, cloudy and cool throughout the year with over 260 annual rainy days. Strong winds and heavy rain are possible at all times of the year; sunny days are rare and overcast days are common. However, if the reader was planning a pleasant vacation to the islands, and had perhaps already packed the beach toys and sunscreen, he should not let this information get in the way, as after all, it came from a humor wiki. 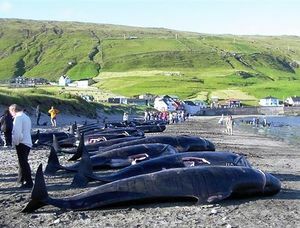 Hurricane Fatwa struck the Faroe Islands on 5 September 1966. The local weather service did not classify this as a tropical storm system but a carnival ride. The natural vegetation of the Pharaohs is dominated by species that thrive in chilly, awful weather. Due to the impossibility of cross-pollination with species living on the habitable parts of earth, species have evolved that are unique to the Pharaohs. They include the Pharaoh swamp thistle, the Pharaoh swamp heath, and the Pharaoh swamp spent soda can. Other species that thrive in treeless wastelands might do well on the Pharaohs. Only, they can't get there. This attractive islander was a runner-up for 2010 Miss Pharaohs. The only wild land mammals found on the Pharaohs were introduced by mankind. These include the wild Pharaoh mouse, the wild Pharaoh rat, and the wild Pharaoh kitty-cat. Like the vegetation, cross-breeding with sensible specimens is impossible. What this says about the local humans is left as an exercise to the reader. The women of the Pharaohs are strong, really strong. A single one with a mild headache and a cold can beat up 15 Danes singlehandedly, and twice that number when fresh and rested. The Norse Vikings who inhabited the Pharaohs were not only some of the best navigators of their time, but they were also nearly made of steel. The Pharaoh Islands are notorious as a nesting ground for Psycho Killer Seagulls (and, to a lesser extent, Pigeons). The Killer Seagulls are an evil species with perilous powers, originally bred by Megatron, ruler of the Decepticons, in order to be vessels for his son's arrival on Earth, bringing doom to us all. The language of the Pharaohs is called Pharisee. Like the flora, the fauna, and the women, the decisive aspect of Pharisee is the physical impossibility of any cross-pollination. Thus, it is one of several derivatives of Danish that is inscrutable anywhere off the islands. However, Norway, despite being nowhere near the Pharaohs, tries to imitate it, calling it Norøysk, or Ny norsk. Klaaksvik is where the Pharaoh people get water, as it is the only place in the Pharaohs where it rains. At Klaaksvik there are huge tanks, surely filled with rainwater or something, and all the Pharaoh people come once every year to celebrate the rain, a celebration called Summarfestivalurin, the day of the year with the most rainfall. (The last four letters of that word are an example of the use of the excretive case of the Pharisee language.) A village called Gøta (the name is Spanish for "droplet") has tried to copy this festival, but the townspeople are too lazy to succeed. However, an activity even more popular than attending the festival is walking along the beach, looking at the ocean, and wishing you were on the other side.